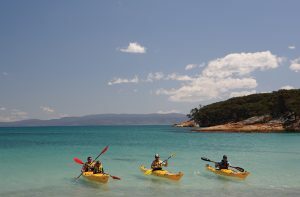 Roaring 40's Ocean Kayaking - Premium sea kayaking eco-tours that will take you to untouched wilderness in pristine waters. 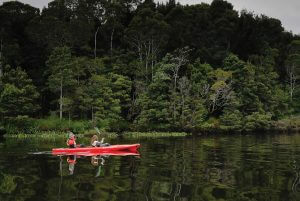 For beginners or experienced kayakers alike, there is something for everyone in Tasmania. 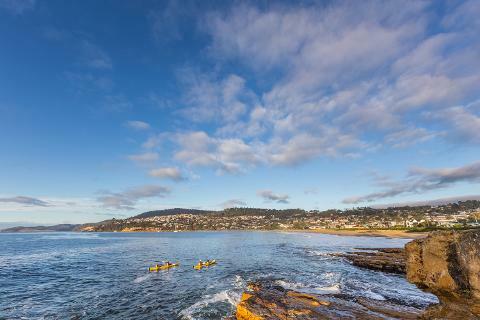 From urban kayaking minutes from Hobart, to the vast wilderness of the Southwest, this great island state provides an array of places and scenery for every type of trip imaginable. Tours of varying lengths are provided for white water kayaking, flat water kayaking, and ocean kayaking. Between Tasmania’s vast river network, beaches, sea cliffs, and the 300 islands, there is no shortage of gorgeous scenery ripe for exploration. Image thanks to Tourism Tasmania & Michael Walters Photography. Although you should confirm and book in advance, many tours will be available year-round with varying hours of operation. Although summers tend to be warmer and milder, it is always best to prepare by bringing multiple layers of clothing at any point in the year. Clothing that does not retain moisture or get damp is best. Also consider bringing a hat, waterproof camera, sunglasses, water bottle and shoes (that can get wet). Most professional tours should have safety equipment on board such as first aid kits and a satellite phone. If you plan to venture out alone, be sure to research in advance that you’ll be hiring from a company that provides necessary safety equipment. Image thanks to Sean Scott. Tasmanian water temperatures can get as low as 9 degrees Celsius. As with many aspects of Tasmania, the weather can vary greatly depending on when you’re going and where you’ll be venturing. Be sure to check weather forecasts in advance and bring plenty of layers of clothing. Difficulty levels of each tour are advertised beforehand so be sure to be comfortable with what you’ve signed up for. Required fitness level for tours will vary dramatically depending on the length and location. Check with your guide in advance to ensure you are at an appropriate fitness level, especially if you cannot swim. 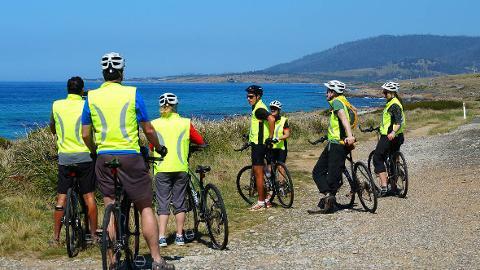 A popular area for tourism, this region of the island includes the Freycinet Peninsula and is abundant with wildlife with plenty of tours to choose from. The weather also leans on the warmer and milder side, making it a pleasant journey with secluded beaches providing beautiful views along the way. Keep an eye out for an array of birds that will keep you company! If you venture to Launceston, consider an urban kayak ride on the North Esk River. 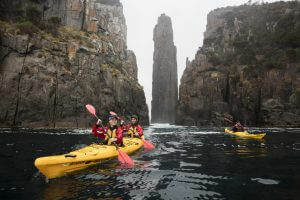 Image thanks to Tourism Tasmania & Sean Fennessy. 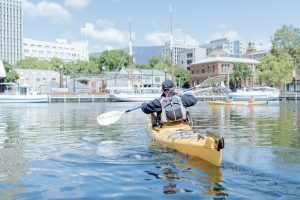 If you’d like to do some local exploring around Hobart, consider kayaking around the waterfront, enjoying views of downtown, or venture a bit to the Huon River. Not far from Hobart, there are many guided journeys that feature dramatic sea cliffs and adventurous ocean swells. The Tasman Peninsula, Fortescue Bay, Tinderbox, D’Entrecasteux Channel, and Bruny Island are some popular options for those that would like to stay in the South. Sea life, including seals and dolphins, are knows to make appearances. Image thanks to Wing Yin Ng. The remote Southwest National Park is home to Bathurst Harbour and Port Davey. 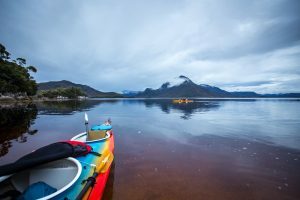 This is considered some of the most stunning and secluded scenery in all of Tasmania to enjoy by kayak. Take your time to explore the wilderness, as some tours last as long as 7 days and include camping on serene beaches. To begin this adventure visitors take a flight to Melaleuca, near the shores of Bathurst Harbour. Be prepared to witness uncharted land filled with legend. Swells in this region can be quite large so consult with your tour guides beforehand to ensure you are well equipped. Image thanks to Tourism Australia & Graham Freeman.